When we humans mourn an animal, we connect to nature — and to each other. OVER THE COURSE of 3½ months, I made more than 30 visits to a nest site that’s surprisingly urban, in the middle of Seattle, in the shadow of the University of Washington campus, where aspirations sometimes rise and fall as suddenly and unexpectedly as the lives of some of the creatures I was monitoring. 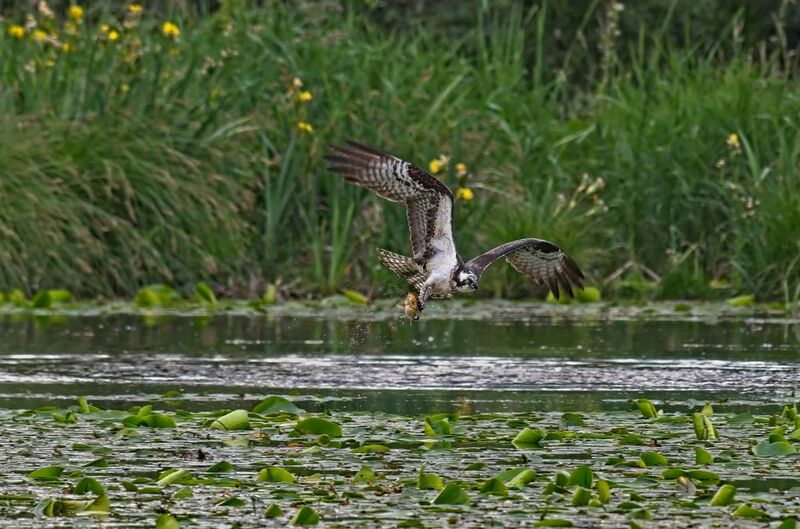 The objects of my obsession were a family of ospreys, the alluring winged predators that, like so many other resident Pacific Northwest species, specialize in apprehending fish. I’d hoped that taking thousands of images of a single subject would bring a heightened level of focus to my photography, and that the notes and observations I kept also would unleash inspiration for what has become a personal quest to strengthen the connection between communities of color and the outdoors. People who know me are not surprised by my choice of subject matter. I love birds. I have been feeding them, watching them and photographing them for decades. They are the fulcrum of a relationship I have forged around nature with my youngest daughter, Mika, who has a genetic disorder; engaging with feathered creatures provides her a source of physical exercise and a sense of connection she often cannot find in judgmental, chaotic human-dominated settings. And Paul Bannick, the friend who helped ignite my passion for wildlife photography, is arguably one of this country’s foremost experts on another bird of prey with mass appeal: the owl. What I hadn’t expected was the project’s dramatic denouement, something I hadn’t seen coming, like a punch in the gut, leaving me dazed and grasping for clarity. 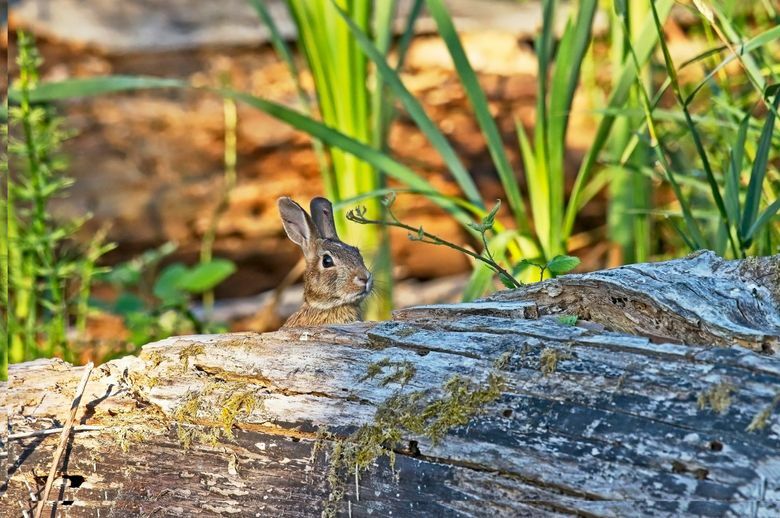 It happened one day in late August, in a corner of a 74-acre wildlife area called the Union Bay Natural Area. 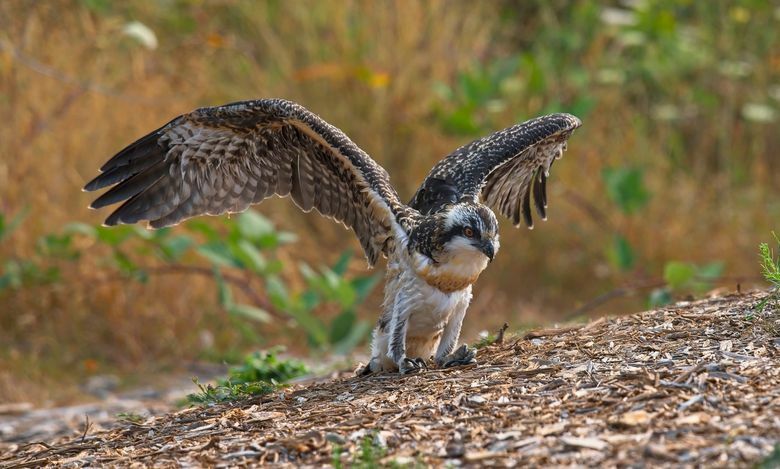 There, a PAWS volunteer tossed a Tommy Hilfiger blanket over a grounded, stunned and likely dehydrated young osprey. I never saw the raptor again. The next morning, in the privacy of my home office, I wept, long and deeply, for an avian life lost too soon. After weeks of processing, I now wish the emotional attachment I felt could be bottled and distributed. So many of our environmental and conservation concerns could be salved with such a powerful balm. In the movement to connect underrepresented populations to public lands and urgent issues such as climate change, local and accessible engagement has become the Holy Grail. And I’d been smitten virtually in my own backyard. I’D SPENT MORE than 125 hours at Union Bay — so much time, that my wife and I started referring to my whereabouts as simply “the nest.” Most of that time I was alone, waiting, watching and thinking. I was hoping to tell a story of nearby nature that, in turn, could build bridges to more distant outdoor venues, and therefore encourage stewardship and political wherewithal in a country undergoing rapidly changing demographics and environmental challenges. But when you fast-forward through the life cycle of a single being, and witness life’s daily dance with death in such intimate detail, the narrative becomes heightened and personal. We were made aware of this recently by the saga of orca mother Tahlequah, or J35, whose “tour of grief” with her dead calf captivated a sympathetic world. Tahlequah’s heartbreak played out off the shores of my hometown and during my time with the ospreys in Seattle. Part of the orca’s appeal was its membership in a critically endangered population; part was the drama’s public setting, as well as the charismatic nature of the “killer whales,” which actually are dolphins. 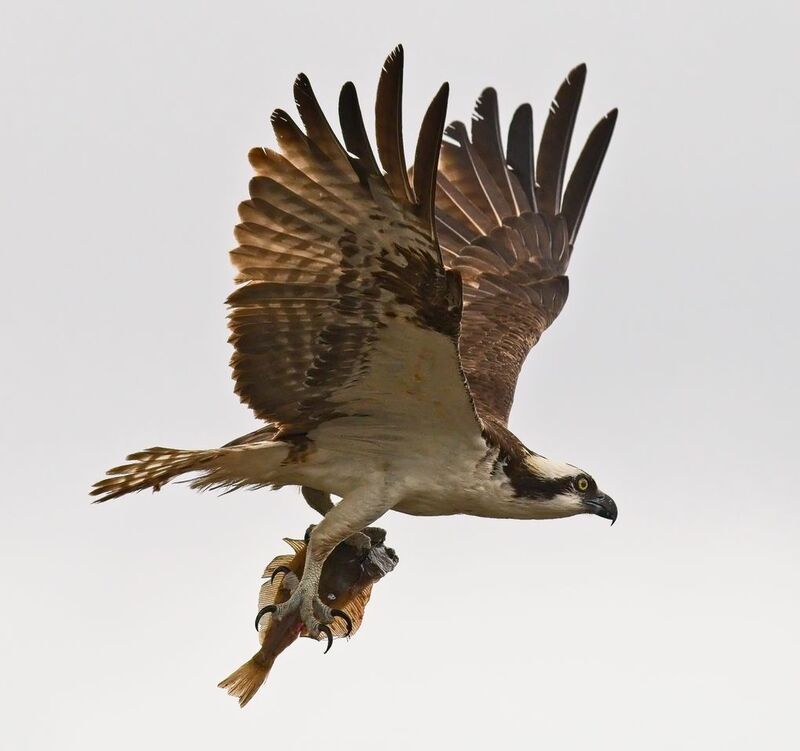 Tahlequah shared a lot of qualities with the ospreys I watched at Union Bay. I’d chosen to follow these birds of prey because, like the treasured bald eagle, they’d rebounded from endangered status caused by once-widespread use of DDT and other pesticides. 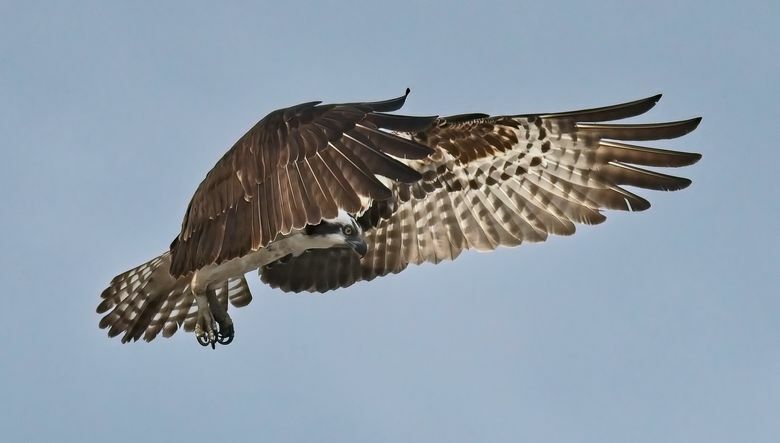 In fact, it can be argued that the eagle made its much-ballyhooed comeback very much on the wings of the ultra-resilient osprey. Bald eagles are fervent scavengers, and ospreys — having elite talent for catching fish — are to our national symbol what Tiffany’s is to jewel thieves. 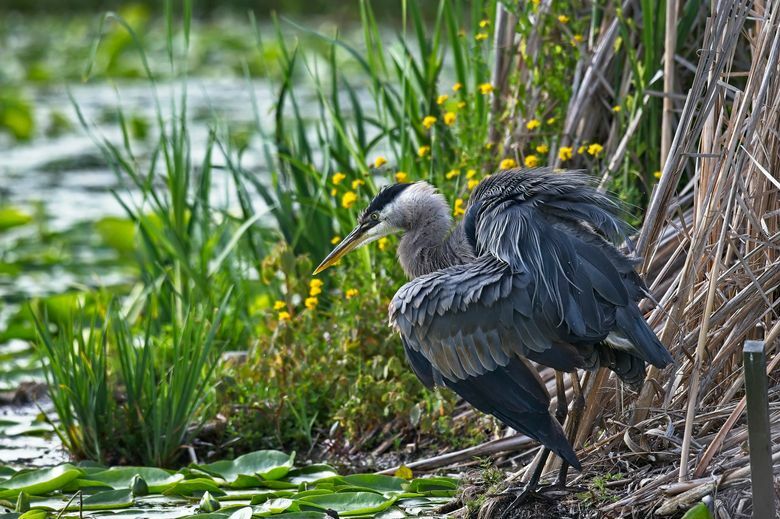 In the cozy, interdependent habitat I observed, great blue herons also took up close residency to the ospreys because the “fish hawks” chased off their common nemesis (the eagles), playing the role of guardian angels to the avian neighborhood. 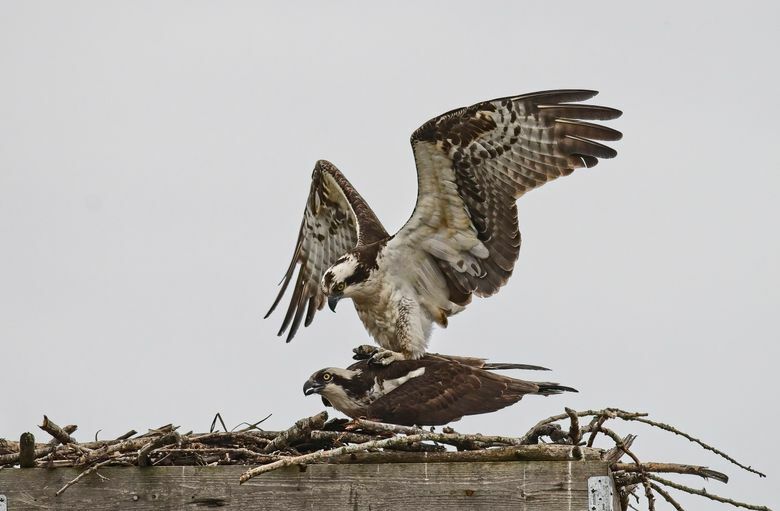 The osprey and bald eagle might have met their environmental match. Both are classified as climate-endangered by the National Audubon Society. 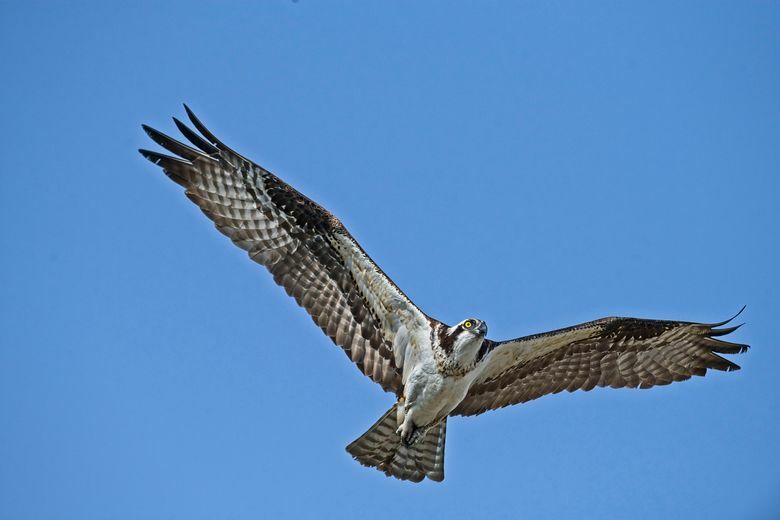 Osprey are projected by 2080 to lose 79 percent of their current summer range in the United States, including in Seattle, according to Audubon climate models. 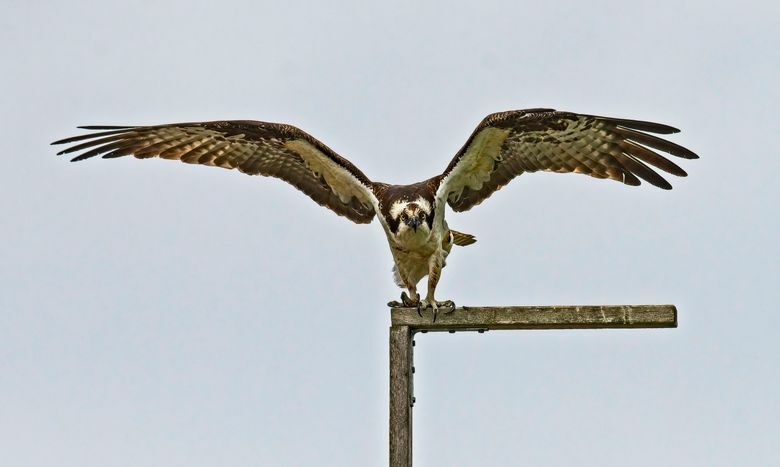 Their tenacity and distinctive appearance, with banded eyes and long, looped talons, make ospreys easy to root for. 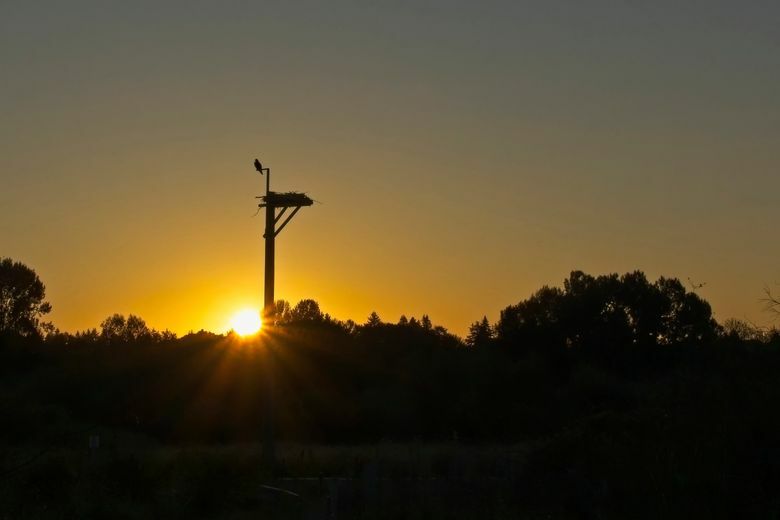 And with their need for open and highly placed nests, man-made platforms, such as the one I observed, have helped the osprey overcome tree extraction and shoreline development, as well as providing great potential for public spectacle and education. THE PLATFORM AT Union Bay affords a particularly generous view. It’s just 40 feet up, so there’s no straining for a clear sighting. Still, I often lamented, even marveled at, our isolation, just the ospreys and me. If they were present at all, humans would parade past the nest with nary a glance, even when the female begging calls were especially loud and insistent. Some days, hours went by without any foot traffic. For my money, all the absent people were missing a show better than any on Netflix. It was long-running, for sure. The first day of my vigil, at the beginning of May, I was wearing long pants and a wool outer layer. Tendrils of lingering fog twisted in the early morning air, and rabbits seemed the only living beings on the move. Then I spotted a lone coyote, which quickly scampered away when I swung down my tripod-mounted camera to photograph it. On the last day of my watch, 18 weeks later in August, I was wearing shorts and layers of sunscreen. The sky was shrouded in the acrid smoke that wafted in from wildfires that burned more than 3 million acres in British Columbia. In between, I watched the breeding pair bolster the nest, fish and feed, and cavort and clash with another pair of ospreys setting up shop nearby. They constantly were harassed by crows, and continuously chased off a pair of bald eagles nesting to the south and another juvenile pair a little bit north. I failed to record with my camera the two most memorable moments I witnessed. One morning, I packed up to meet my nephew for breakfast, heard a ruckus as I walked away and turned to see both ospreys going at it with one of the adult bald eagles right below the nest. Another afternoon, I froze with fascination as a mob of crows burst suddenly out of nearby trees, led by a pair of peregrine falcons screaming through the air as if jet-propelled. The most chilling thing I witnessed, several times, was a group of young men, outfitted with what looked like the proton backpacks from “Ghostbusters,” spraying chemicals everywhere. The whole time, I also witnessed the comings and goings of a supporting cast straight off the Lido deck of Noah’s Ark: In addition to howling coyotes and bouncing bunnies, there were green herons, American bittern, kingfishers, killdeer, wood ducks, Caspian terns, turtles, Vaux’s Swifts, Virginia rails, double-crested cormorants, merlins, red-winged blackbirds and red-tailed hawks, just to name the not-so-common varieties. 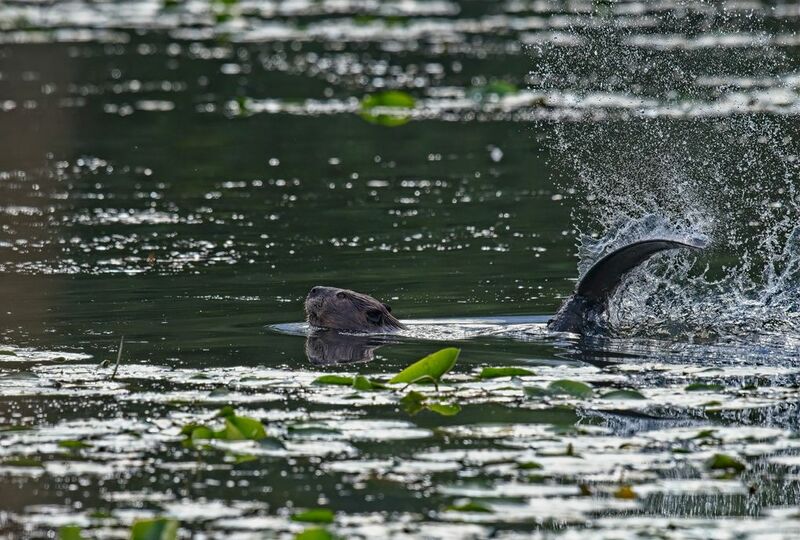 Once, standing on the edge of the inlet behind the osprey nest, I was startled by a large splash right near me. When I looked out, there was a beaver, issuing a warning by bashing its big flat tail against the water. BY THE FOURTH of July, there were no fireworks, but the vibe of the area turned discernibly serious. 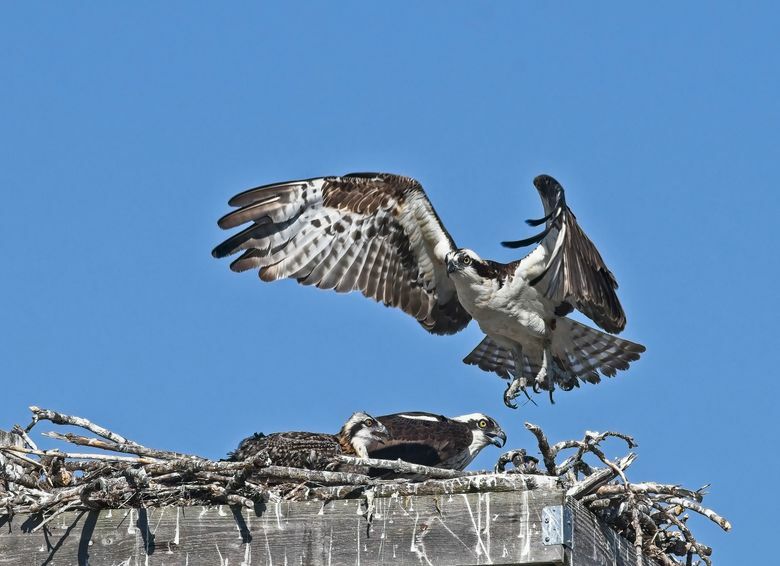 Two hatchlings appeared in the osprey nest. 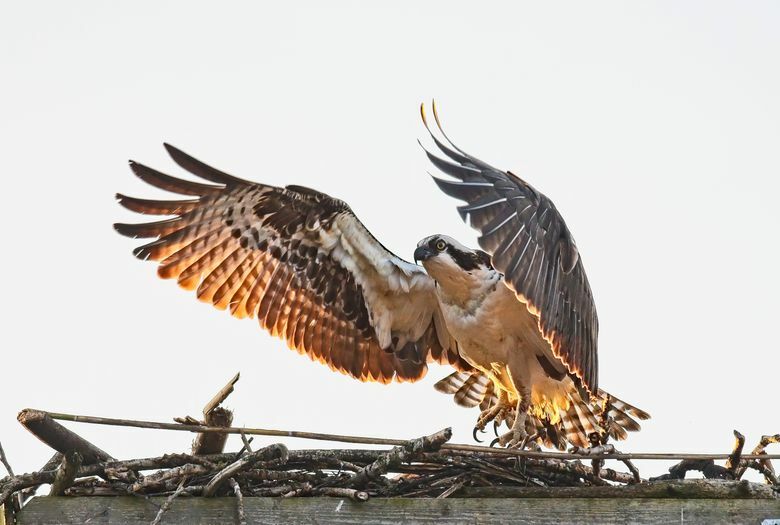 The calling back and forth and the activity of the two osprey adults increased. But something was off. I left for a reporting trip at midmonth and, when I returned, one of the chicks was gone. The larger of the two remained. 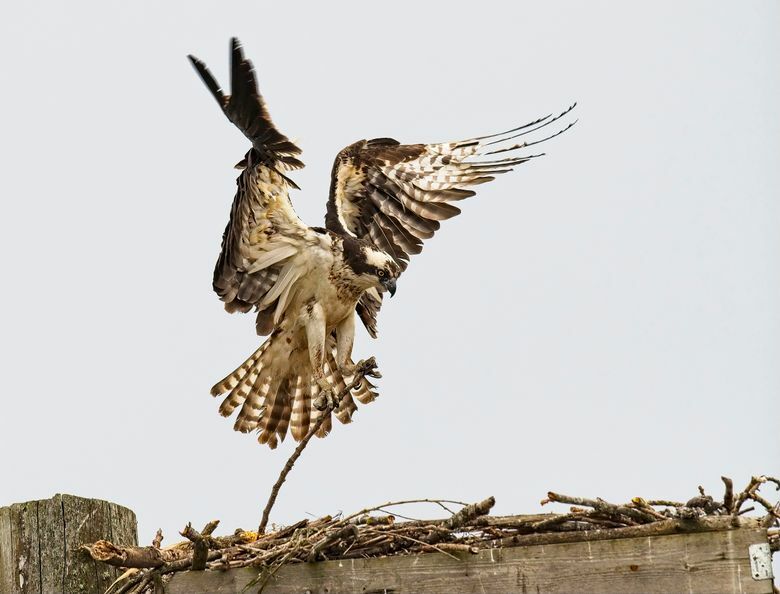 By then, I’d observed abnormally long absences by both adults; it is rare for female ospreys to leave a nest with hatchlings except for short stretches in nearby perches. My observations about the absent parents were shared by two longtime observers of the area — Connie Sidles, a naturalist and organizer who has written books about the site, and Larry Hubbell, who operates a popular photography blog about the area, Union Bay Watch. 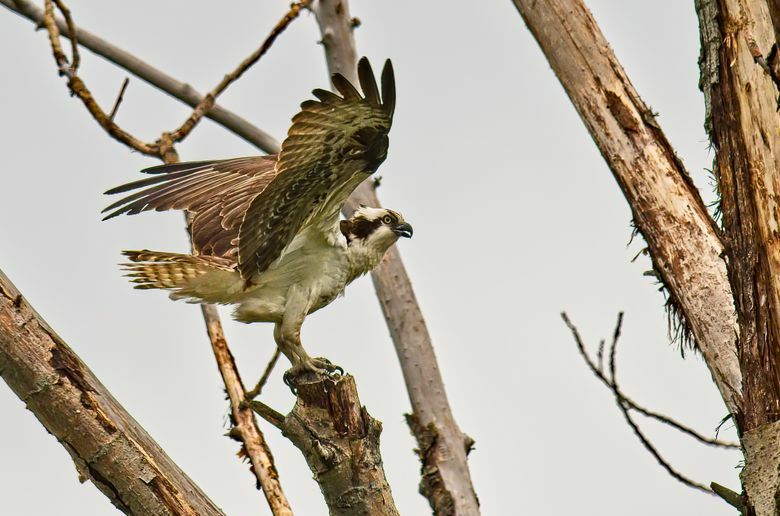 During the final weeks of the juvenile osprey’s life, I noted another marked change. The adult female started making almost-frantic begging calls for as long as 25 minutes straight; they’d go unheeded by the male, supposedly cued to supply a meal to offspring and mother. Soon, the female began leaving for long periods of time. For several of my three-to-four-hour stays, I never saw the adults. The young osprey would lean its head on the edge of the nest, peer down at me (or, more likely, my camera) and chirp. I fought hard not to anthropomorphize. Then, at the start of the final four days, the adults seemed to be coaxing the osprey to fledge (try its first flight out of the nest). The female hopped around, vocalized at its offspring, and jumped up and down from the perch attached to the nesting platform. The male brought fish to the nest but would immediately leave with it, circle and repeat, then circle and flaunt the fresh catch right in front of the youngster and fly off. There was an urgency in the air. Because a fledge seemed imminent, I returned daily. What I planned as a quick check-in on the last afternoon stretched into evening. 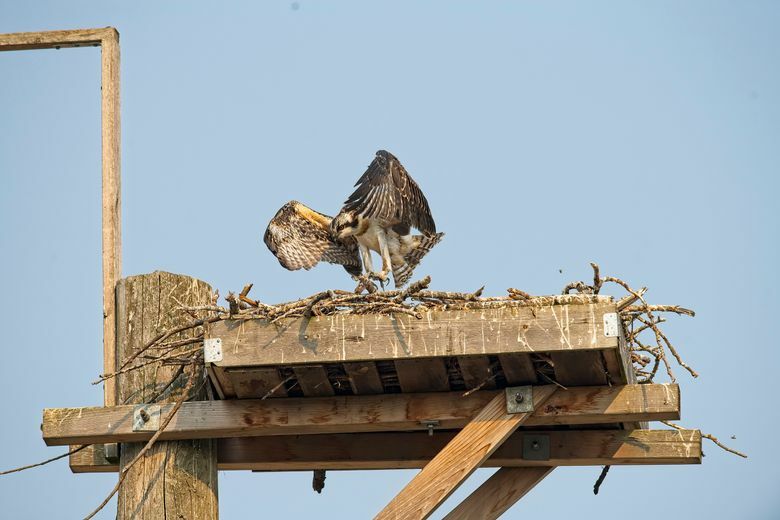 The juvenile raptor continually maneuvered to the very edge of the nest, looked down, chirped almost precipitously and seemed on the verge of making the leap. Each time, it backed away. It wasn’t ready. 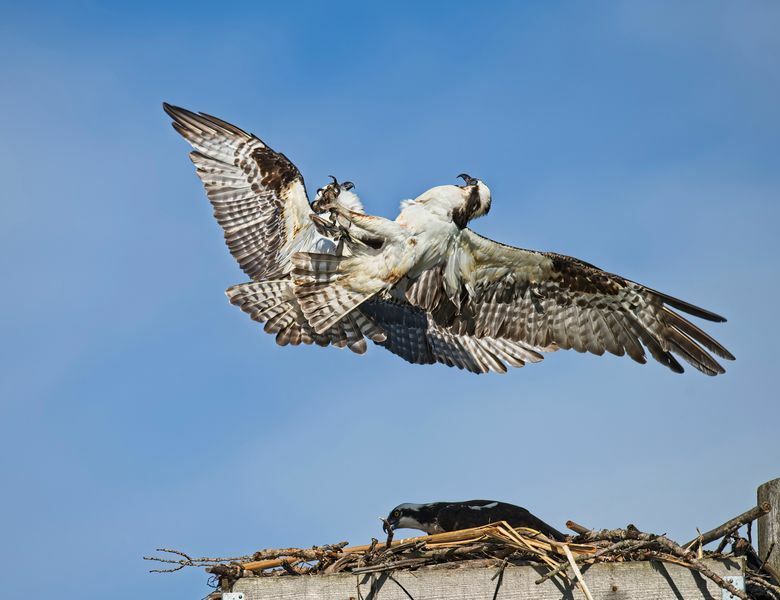 I’d never even seen it successfully “helicopter” — flap several feet above the nest, as osprey do to prepare for departure. I left when it became too dark to see clearly. The young osprey hadn’t been fed, missing what had been two pretty regular feeding times. I RETURNED THE next morning — the last morning — scheduling my arrival for what usually was the first feeding of the day. A woman walked away, shaking her head as I approached. “No sign of life,” she said, gravely. I looked up at the empty nest, and my heart sank. I remained, hoping for a miracle — mainly that the young osprey in a single nighttime had developed the capacity to fly and soon would return. I spent so much time around these birds, I felt especially attuned to them. I’d be able to locate them by sound on distant perches, or on approach far away. That connection served me one last time. I heard a faint chirping and found the young osprey on the ground. 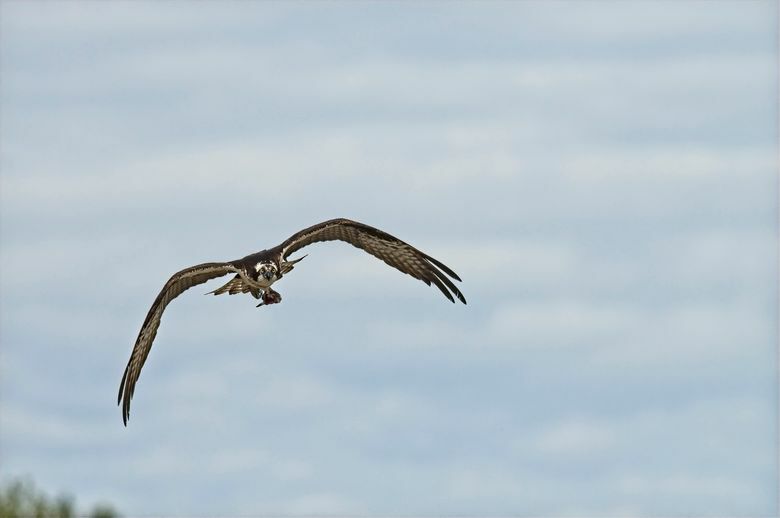 A few days later, the PAWS volunteer wrote to let me know that his organization on average rehabilitated one adult and one juvenile osprey every year. However, in this instance, its veterinary team didn’t have the time or resources to perform any post-mortem evaluations. It was left to Hubbell, Sidles and me to compare notes with Jim Kaiser, a nationally renowned expert on raptors who’d installed the Union Bay platform. Based on our observations, Kaiser suggested that we’d witnessed a case of “food stress.” The fish in Lake Washington were abundant enough, even in escalating heat, he said. 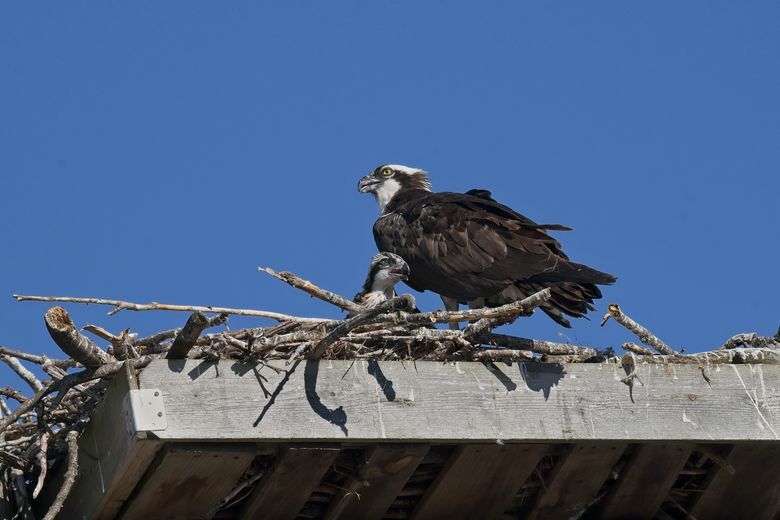 The challenge likely was the maturation of a pair of juvenile bald eagles nesting nearby, as well as untold others aware of the ospreys’ presence. 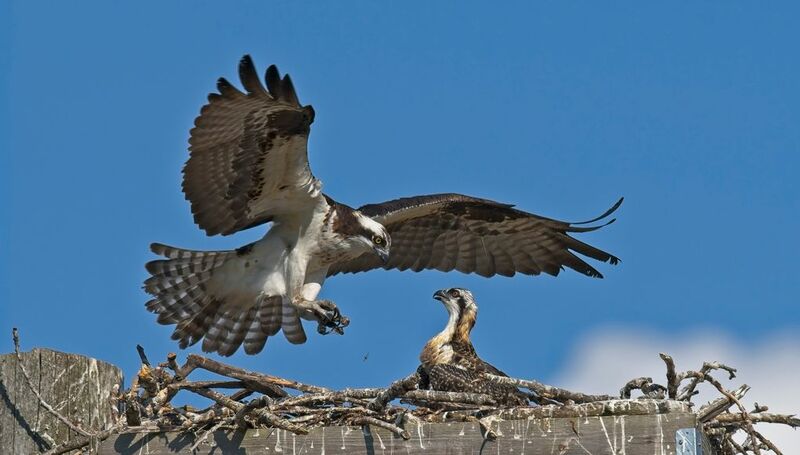 The lot of them likely were pilfering from and battering the male osprey with more and more impunity. I’d noted that the male several times returned empty-handed to the nest. I’d not thought much of it, but Kaiser said it was telling. “The osprey must pay taxes to the national symbol,” was the way he put it. It made sense. 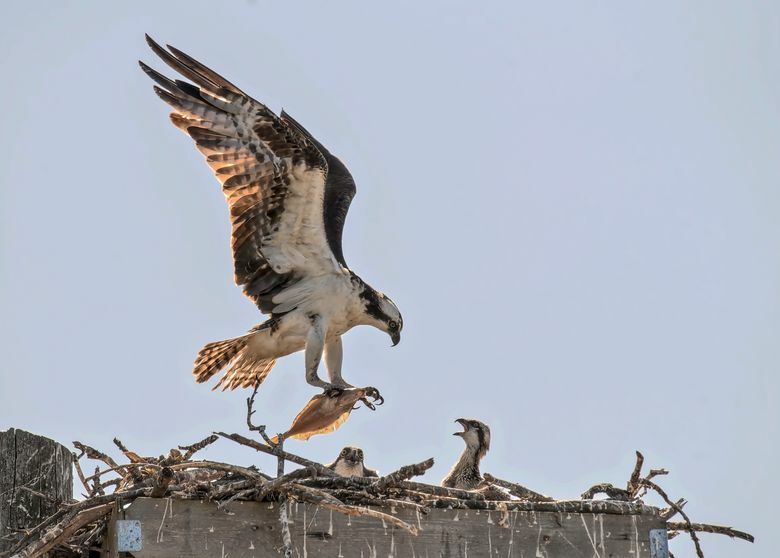 At some point, the survival instinct in the adult ospreys kicked in and made a cold calculation about propagation of family or, to a larger extent, species. It explained the prolonged absences of the adults, especially the female. They’d first taken risks to feed their young, and that risk eventually escalated into the necessity of feeding themselves. I didn’t like the outcome, but it’s the explanation I’ve decided to accept. I keep watching a video I took of my departed feathered friend. With its mother overlooking from the perch, the juvenile calls in what can be interpreted as a gleeful tone. Then it flaps its wings wildly, going nowhere, but going there determined as hell. It makes me smile and feel something in addition to happiness. It’s a collective hope, I think. 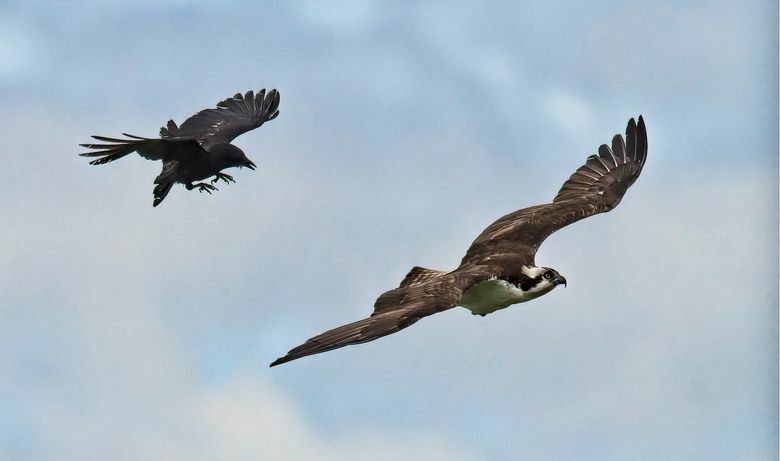 Because when that hope is snuffed, whether in the form of an osprey chick or orca calf, in mourning we feel our connection as beings in the same world. Glenn Nelson, a former Seattle Times reporter, founded The Trail Posse (trailposse.com) to cover the intersection of race and the outdoors.